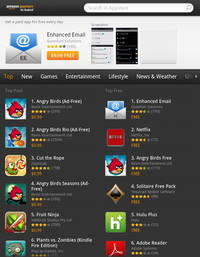 The Amazon Appstore for Android is an app store for the Android operating system operated by Amazon.com. It was opened on March 22, 2011 and was made available in nearly 200 countries. Developers are paid 70% of the list price of the app or in-app purchase. On September 28, 2011, Amazon launched the Kindle Fire tablet. The tablet, designed for media consumption in the Amazon ecosystem, relies solely on the Amazon Appstore for its marketplace, eschewing Google Play. Alongside the tablet was a new design for the Amazon Appstore, intended to better integrate with the tablet's user interface. On June 18, 2014, BlackBerry announced an official relationship with Amazon, which includes access to the Amazon Appstore in BlackBerry 10.3. The Amazon Appstore included the "Free App of the Day" feature. Every day, an application, frequently a game, was offered for free. On the launch day, this game was Angry Birds Rio (Ad-Free), in itself a promotional game. On The European launch day, the free app was Angry Birds (Ad-Free). The Free App of the Day feature made an exception to Amazon's payments, instead giving the developer none of the list price during the featured day. The store's "Test Drive" feature allowed users to try an application in their web browser by launching a virtual copy of Android in the Amazon EC2 cloud for half an hour. The Test Drive service was decommissioned in 2015, Amazon saying that the service had been in decline, partly due to many apps not supporting the feature, and the increasing prevalence of the “free-to-play” business model making it obsolete. In May 2013, Amazon introduced Amazon Coins as a form of payment on the store. When the Appstore for Android launched in March 2011 it had about 3,800 apps. In June 2014, the app store had seen significant growth since June 2013, tripling the app selection from 80,000 to 240,000. In June 2015, the app store had nearly 334,000 apps. On 28 January 2019, Amazon App Store had 452,054 applications listed. Shortly after the Amazon Appstore launch, the International Game Developers Association (IGDA) published an open letter expressing concerns that were primarily aimed at Amazon's distribution terms. The main concerns about the conditions were that Appstore terms force developers to permanently lower their AppStore prices if ever they do promotions on other stores, and that Amazon could choose to lower the price of an application while deciding to reduce the developer's share without having to ask permission. Following this address, Amazon clarified the Appstore developer agreement, but this did not assuage the IGDA's concerns, which declared that "Amazon’s terms represent a threat to game developers". In July 2011, the Swedish developer Bithack pulled its Apparatus application from the Appstore and published an open letter explaining that the store was a "disaster" for indie developers. The main problems related to the very slow review process, the absence of any means to filter unsupported devices, and that Amazon changed the price of the application without consulting the developer, leading to the IGDA reiterating its warnings concerning Amazon's policy once again. See also: Apple Inc. litigation § Amazon "App Store"
In January 2013, Apple's claims were rejected by a US District judge, who argued that the company presented no evidence that Amazon had "[attempted] to mimic Apple’s site or advertising", or communicated that its service "possesses the characteristics and qualities that the public has come to expect from the Apple APP STORE and/or Apple products." In July 2013, Apple dropped the case. ^ "Install Amazon Appstore". Amazon. Retrieved May 6, 2018. ^ Amazon.com (2013-05-23). "Developers Can Now Distribute Apps in Nearly 200 Countries Worldwide on Amazon - Amazon Mobile App Distribution Blog". Developer.amazon.com. Retrieved 2013-11-27. ^ "Amazon Appstore | Android". SigitArinto.com. 2011-03-22. Archived from the original on 2011-08-27. Retrieved 2011-04-05. ^ Ned Potter via Good Morning America (2011-09-28). "Amazon Tablet: Kindle Fire Announced by Jeff Bezos to Beat Apple iPad for $199, Relative Bargain - ABC News". Abcnews.go.com. Retrieved 2013-11-27. ^ "BlackBerry will bring thousands of apps from Amazon's store to its phones". The Verge. Retrieved 18 June 2014. ^ "Amazon Appstore Compared with Google Play". Andromint.com. 28 October 2013. Archived from the original on 31 October 2013. Retrieved 2013-10-28. ^ "New Amazon Android App Store - 1 Free App / Day - Baltimore Sun". Articles.baltimoresun.com. 2011-03-22. Archived from the original on 12 April 2011. Retrieved 2011-04-05. ^ "Amazon Appstore, Not so Amazing". GigaOM. 2011-07-05. Archived from the original on 9 July 2011. Retrieved 2011-07-06. ^ Jason Kincaid (2011-03-22). "Amazon's Android App Store Launches: Test Drive Apps Directly From Your Browser". Techcrunch.com. Archived from the original on 28 March 2011. Retrieved 2011-04-05. ^ Amazon Appstore triples selection to 240,000 apps June 2014. ^ Amazon App Store for Android. Retrieved 23 June 2015. ^ "Amazon Appstore: number of available apps by quarter 2018 | Statistic". Statista. Retrieved 2019-01-28. ^ "IGDA warns Android game developers about Amazon's Appstore terms". guardian.co.uk. 2011-04-14. Retrieved 2011-05-14. ^ "IGDA Outlines 'Significant Concerns' Over Amazon Appstore Terms". Gamasutra. 2011-04-14. Archived from the original on 10 May 2011. Retrieved 2011-05-14. ^ "Clarification about Amazon Appstore Developer Agreement". Amazon.com, Inc. 2011-04-15. Archived from the original on 11 May 2011. Retrieved 2011-05-14. ^ "Amazon's clarification fails to address game developer concerns". International Game Developers Association. 2011-04-19. Archived from the original on 11 May 2011. Retrieved 2011-05-14. ^ "Tir de barrage contre Amazon". Canard PC. 2011-04-14. Archived from the original on 2011-05-18. Retrieved 2011-05-14. ^ "Apparatus will be pulled from Amazon Appstore". bithack.se. 2011-07-04. Archived from the original on 2011-07-05. Retrieved 2011-07-15. If you are a small indie development team, or possibly even alone, don't bother with Amazon Appstore. Create a great app, publish it on Android Market, and provide great customer support. You will never succeed on Amazon Appstore without a big wallet, or at least an established reputation so that Amazon puts value behind their promises. ^ "Game developer pulls app from Amazon Appstore over problems". The Inquirer. 2011-07-05. Retrieved 2011-07-15. The final problem was that Amazon changed the price without consulting the developer. The price was cut to $0.99, only a quarter of its original price, which, while perhaps good for players, is not good for the developer. ^ "IGDA still unhappy with Amazon Appstore policies". Joystiq. 2011-07-08. Retrieved 2011-07-15. ^ Eaton, Kit (March 22, 2011). "Apple sues Amazon over 'app store' name". CNN Tech. Retrieved September 15, 2012. ^ Cheng, Jacqui (April 26, 2011). "Amazon responds to Apple: "app store" is generic, toss the suit". Ars Technica. Retrieved September 15, 2012. ^ "Apple claims Amazon Appstore 'tarnishes' App Store trademark". Electronista. June 10, 2011. Retrieved September 15, 2012. ^ Levine, Dan (July 6, 2011). "Judge rejects Apple bid for injunction against Amazon". Reuters. Retrieved September 15, 2012. ^ Cheng, Jacqui (November 18, 2011). "Kindle Fire Dragged Into Apple's 'App Store' Suit Against Amazon". Ars Technica. Wired. Retrieved September 15, 2012. ^ "No app for that: Apple's false ad suit over Amazon Appstore thrown out". Ars Technica. Retrieved 4 September 2013. ^ Bostic, Kevin (2013-07-09). "Apple drops 'App Store' lawsuit against Amazon, says no need to pursue case". Appleinsider.com. Retrieved 2014-01-02.